We have acquired a number of handwritten letters from Moe Howard of the Three Stooges to a personal friend of his, a handicapped young girl. Some have extraordinary content. 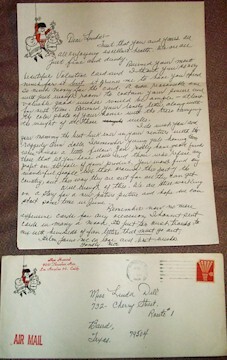 All are on Three Stooges letter head and comes with the original postal dated Three Stooges envelops. Here is a terrific one page handwritten signed letter on Three Stooges letterhead. He writes in part; "....I do wish you and your mommy the best luck ever in your venture with the raggedy ann dolls, I remember young girls having them when I was a little fellow. You really have good friends , those that let you have dolls and those who refuse any profit on the sale of your product. You wont find any wonderful people like that around this part of the country, out this way they are out for all they can get. Well enough of this. We are still working on a story for a new feature picture and hope we can start some time in June..." Signed "Moe," at the conclusion. Comes with the original transmittal envelope with a 3 stooges image logo and his name typed on the envelope. Cancelled in 1968. An intimate letter to a fan who apparently became a friend over the years. Guaranteed Authentic for Life! All letters comes with COA from Conway's Autographs and Todd Mueller Autographs. 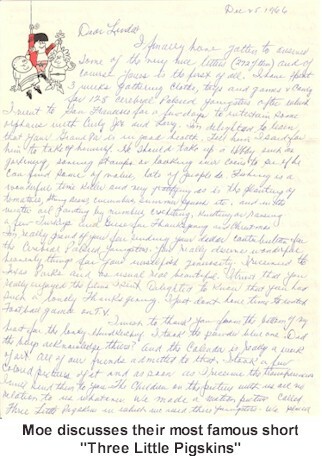 - Letter from 1966 - "dated Christmas Day, 1966. He writes in part; ".....The children in the picture with us are no relation to us whatever. We made a motion picture called Three Little Pigskins in which we used these youngsters. We placed requests with talent agencies asking for youngsters who looked like us and believe it or not there came about 150 kids and it was difficult to select the 3 we did as there were many who looked like us (poor kids).... and; ".....Larry (Fine) looks, not only like an Australian Doola Bear, He also looks like a wild mongoose and combs his hair with an egg beater. You like quite more beautiful than I do so don't let people compare you with me....." Signed; "Moe," "
ALL are on original Three Stooges stationary and include the original transmittal envelop. A few more with extraordinary content. If interested emails us for more info.